You can rent our newly, fully renovated studio unit on a monthly basis directly from us, the owners. This type of rental can save you up to 50% from rental company rates. 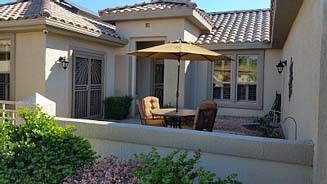 This is a Del Webb 55+ community, located in Surprise, a city in the NW Valley of Phoenix, close to the NFL stadium and numerous MLB spring training sites. This is a Del Webb 55+ community located in Surprise, a city in the NW Valley of Phoenix, close to the NFL stadium and numerous MLB spring training sites. Sun City Grand is an active adult community with two large rec centers, four 18 hole golf courses, indoor and outdoor pools, cardio and weight rooms, tennis and pickle ball courts, biking and walking paths. Other activities include softball, wood working, card playing, community theater, concerts and an art studio. This is a lovely, completely remodeled studio unit that is attached to our home, but offers a private separate entrance. This unit includes a kitchen with a full size fridge, microwave, stainless steel sink, new custom cabinets and beautiful granite countertops. 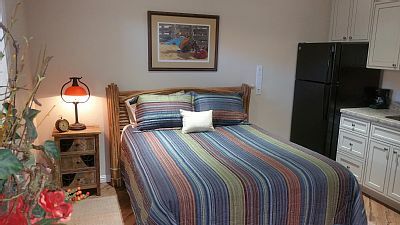 This studio unit also offers a TV / living room seating area, walk-in closet and new bathroom with a large walk-in shower. 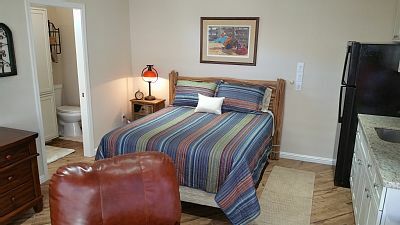 A large king size bed completes the well decorated unit. The private French door entrance leads to an outside patio seating area complete with table/chairs and a BBQ grill. 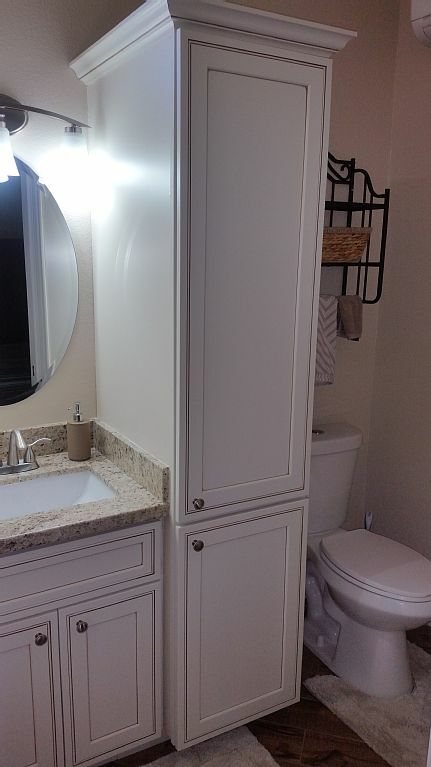 You will have access to both a washer and dryer in the garage area. Driveway parking available. This is a great place to enjoy the beautiful Arizona winter weather. This unit is perfect for a single person or couple who wants to experience all the Sun City Grand complex has to offer. NO PETS AND NO SMOKING ALLOWED!! The suite has a queen-size bed and private bath. 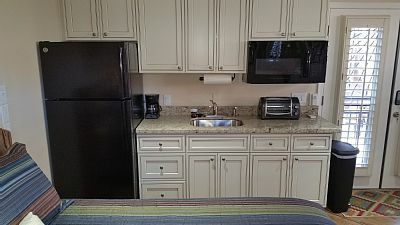 The kitchenette is fully equipped with all new appliances. And, you'll get an unbelievable backyard fun with fire pit and patio! If you want a full-size rental home, click here to check out our fully-renovated 2-bedroom/2-bath Sunrise, AZ home.